The Peugeot 108 is the second generation of the city car jointly developed by Peugeot, Citroen and Toyota. The 108, C1 and Aygo are produced by the same factory in the Czech republic. It's a small, safe, quality car designed for 4 occupants in a tiny package - kind of like the original Mini in concept but with increased height for better packaging. They share approximately 70% of their components including bodyshell, gearboxes and engines with each other but each model has its own spec, look and trim. All are available in 3 or 5 door and the 108 has a choice of naturally aspirated 1.0 or 1.2 three cylinder, petrol engines. The test car was fitted with the larger of the 2 engines - a 1.2 with 82bhp and a useful 86lb/ft torque - and has a 5 speed manual gearbox. The new range of 3-cylinder ‘Pure Tech’ engines are made from aluminium to save weight but are fitted with cast iron cylinder liners for longevity and feature a raft of fuel saving features. Spec levels start at Access followed by Active then Allure and finally Feline. The test car came in Allure spec which has many bells and whistles for such a small car and includes but a reversing camera, bluetooth phone connection and music streaming, keyless entry and start, large touchscreen DAB radio along with the usual, but maybe not standard on supermini, electric windows, electric mirrors, air conditioning, rev counter, LED daytime running lights and tyre pressure sensors. The whole idea behind city cars is motoring on a budget and the 108 puts a tick in this box as even with the largest available engine fitted the CO2 rating is 99 g/km, meaning free road tax, and the combined fuel consumption figure is 65.7mpg. Insurance is group 11E. In addition to cheap running costs superminis also need agility to manoeuvre around town and park easily. Again the 108 fulfils this role due to its tiny dimensions and light steering. The packaging is pure genius and every inch of available space has been utilised by something or other. By designing the car around small, three cylinder engines there is no wasted space in the engine bay and so overall length is as short as it possibly can be. At the front there is a small overhang, just enough to satisfy pedestrian impact and crash tests but also to retain a small overall dimension so it is easily visible to aid parking and manoeuvring in confined spaces. The 3 door model has quite long doors to aid rear access. They open in staged notches so can be opened in several varying degrees when exiting without fear of knocking the car next to you. At the rear there is no tailgate to speak of but instead a hinged glass rear screen with integral wiper. This works well in daily use although the small aperture means there is a high boot lip impeding access for getting heavy shopping in. Styling wise Peugeot has followed Mini in its customisation program. The 108's main visual option is a two tone paint job as seen here in Purple Berry and Zircon Grey. Lots of other customising kits are available from mirror covers to transfer kits and the theme spreads through to the interior and even the key fob. The interior packing is where most of the ingenuity lies. The front seat sits fairly high so the driving position is a little more upright which means rear passengers feet can fit under the front seats comfortably. This also aids visibility when manoeuvring around and especially so when parking. In the front there is plenty of headroom, I am 5'9 and there were a good 4 inches clear above my head so whilst the car is small you don't feel claustrophobic on the inside. The sports style seats have fairly squashy side supports but are comfortable nevertheless. Leather seat facings are an £650 option. Rear seat passengers also have good headroom unless they lean backwards intentionally and then the headlining can just be felt. There is only space and belts for 2 in the back so this is a strict 4 seater which meant the car could be designed narrower than 5 seaters which again saves weight and helps drive through tighter gaps. Whilst on trial I tested out the real world usability of the cabin with a trip to the pub with 3 friends, one of whom is 6'3 and the others 5'10 and everyone had sufficient space to be comfortable. Quite some achievement for such a tiny car. The boot appeared tiny at first due to the high lip but look further and it is deceptively deep which swallows quite a lot of luggage, certainly enough space for a families weekly shop. Lift the boot carpet and amazingly they have squeezed in a spacesaver spare wheel and tyre under there although this is only standard on Allure and above. The engine is started with a stop/start button on the centre console and kicks into life with a kind of electrical whirr style noise. As the motor warms and the revs settle the sound softens to a gentle murmur. Oddly the steering column only adjusts for rake and takes the instruments with it which makes the motion feel heavy but as I only needed to adjust it once this was no issue. This does also mean that the position of the clocks is spot on. There is a large central speedo with the fuel level and trip computer functions in the centre and a vertical digital rev counter off to the left. The driving position once set is actually pretty good, the wheel could do with coming toward me a little but overall it is comfortable with everything to hand. All the controls are light, the steering particularly so with easy slow speed manoeuvring meaning quick turns into a parking space are done with ease. There is a self centring action at higher speeds and a more positive motion as it weights up over 40mph. When on the go the engine is a little belter. Yes it does need revving due to its modest power output and you need to be in the correct gear to keep things moving along nicely but when you do so it is very enjoyable. At higher revs the little three-pot sounds thrummy and toward the red line quite harsh but the odd number of cylinders provides real character in terms of both torque and sound. The flywheel is offset to balance vibrations from the odd number of cylinders but the buzzy, unbalanced nature is still felt which I liked and made me change up higher up the rev range than I normally would. It is certainly more entertaining than a four pot. The gearbox is a sweet five speed unit and has a tall and circular gear knob that makes changing gear fun with a positive shift action. Just five gears is enough for the little motor which red-lines at just over 6,000rpm and at 70 mph it is ticking along nicely at just over 2,500 revs. The clutch has the usual small Peugeot annoyance of being hinged from the left so your left foot fouls the pedal arm when stepping on the clutch pedal from the rest position. The chassis engineers have got their way over the designers and this 108 wears little 165/60/15 tyres so the suspension only has a small amount of unsprung weight at each corner. Some fairly elastic feeling damping and long travel suspension keeps each wheel firmly on the ground so it can be chucked around with confidence yet also has a surprisingly supple ride quality. It does help that you are doing lower speeds than you would in a larger car but that is part of the appeal as 'normal' trips out can turn out to be rather enjoyable due to the provocative nature of the fizzy engine and engaging, fun chassis. The brakes are capable with strong positive action from the servo, even four-up they still felt confidence inspiring. Fully loaded with people the performance, however, is dulled as the power to weight ratio is seriously reduced but it's safe and acceptable for one-off trips. The handling is also affected with more bodies on board with more pronounced understeer but again nothing scary. The rear three quarter view on the 3-door 108 is pretty terrible. If you are on the motorway in lanes two or three and want to move a lane to the left the view over your left shoulder is mostly the tall front passenger seat but also the very wide C pillar. Instead you have to alter your driving style to rely on the large mirrors and plan ahead. This doesn’t affect parking so much as the test car was fitted with a parking camera as standard, which is viewed on the large central screen. When reverse is selected the camera kicks in to provide a clear rear view and guides you into parking spots with a set of side lines. This negates the need for parking sensors and proved to be more intuitive - being able to see rather than hear if you are about to hit something. The rest of the tech was also up to scratch with a quality 4 speaker sound system controlled by the 7 inch touchscreen display and wheel mounted controls. This plays either DAB radio or music from your own device via Bluetooth, USB or headphone jack and both inputs worked a treat with excellent quality sound. It seems strange at first having no CD player but many people now have an iPod or its equivalent so why pay for a CD player that may not get used? Very forward thinking for Peugeot but also disappointing if you haven’t got a music device as a CD player can’t even be optioned. Another oddity is the lack of satnav. It's only available as an option in the form of a Tom Tom that you stick on the windscreen. This gets a thumbs up from me as I have nothing but praise for the most intuitive and accurately mapped navigation tool on the market but for some the lack of integration could be a turn off. Tested over a week at freezing temperatures and left outside at night the heater proved to be quick to warm the cabin and then provided a toasty source of heat when on my way. The interior is filled with little cubby holes, cup holders and bottle holders and real thought has gone into clever use of the available space. There must have been a small void available behind the glovebox as it has been opened out so a 1 litre bottle can be inserted lengthways into it and kept a little cooler than within the cabin on a hot day. Little features like this make it easier to live with and more pleasant to own. As tested this 108 Allure was just over £12,500 which is good value considering it is near the top of the range and has a huge specification. If you fancy a little wind in your hair motoring the 108 ‘TOP!’ Is available with a fully electric folding fabric roof and is available on most specs for an extra £1,000. 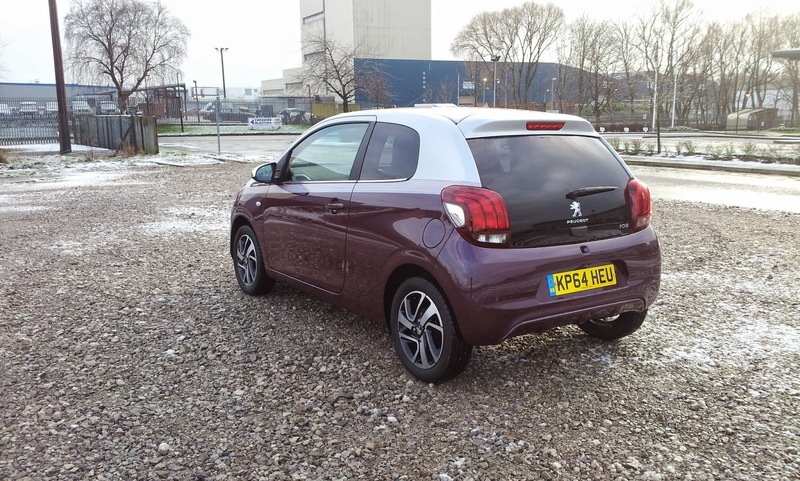 As a whole the 108 is a well-made, superbly packaged little car with a fun chassis and bubbly engine meaning low cost motoring doesn’t have to be low fun motoring. If you are in the market for a small city car I heartily recommend a test drive in the little Peugeot 108.